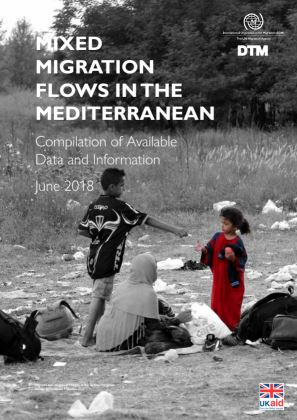 Between January and June 2018, a total of 58,357 migrants and refugees reached Europe through different sea and land routes. More than 75 per cent of the overall population crossed the Mediterranean Sea, mainly using the Central Mediterranean route that still leads to Italy. 16,577 new sea arrivals were registered in Italy between January and June 2018. Despite receiving the highest proportion of the sea arrivals reported this year, in terms of overall arrivals (land and sea), Italy was surpassed by both Spain and Greece during the second quarter of the year. Authorities in Spain registered a total of 17,950 arrivals between January and June 2018, two times more than the 9,401 reported in the same period in 2017. At the end of the second quarter of 2018, Hellenic Authorities reported 22,899 new arrivals to Greece, more than twice the 10,676 registered in the same period in 2017. Arrivals to Italy increased in the second quarter of the year, from 6,296 registered between January and March to 10,281 registered between April and June 2018. In contrast to that, the number of arrivals registered between January and June 2018 represent a significant decrease in comparison to the same period in 2017.